Wildlife Removal Services is the industry leading pest removal service company in San Diego County. They’re able to capture and remove skunks, raccoons, squirrels, snake and all other flying and ground dwelling critters. The client had a website that was designed by another designer, and although the website was functional, it was time for a complete redesign to bring their site and business up to today’s standards..
WordPress is always the go to solution for businesses of this size and with this traffic count. So keep costs as controlled as possible, I leveraged an existing WordPress theme and custom designed the site from there. One of the great benefits of starting with a modern theme is your site will be mobile-ready right out of the gate. 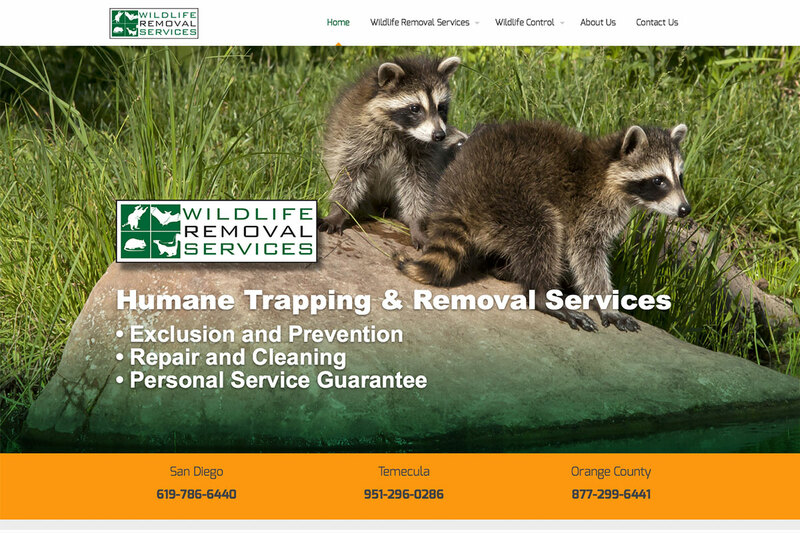 Wildlife Removal Services was so satisfied with their website, they offered me all future work for web, print materials, and trucks graphics. Robert has been woking with our company for abut 3 years now, designing business logos, and redesigning our website. Everything Robert has designed turned out exactly the way we wanted. He is our go-to guy for any marketing and design. The MosaicVisual Pledge | MosaicVisual Communications is a full-service, top web design and online marketing agency in San Diego, with over 25 years experience in visual design and marketing communications, dedicated to producing great visuals for our clients and partners. Whether you need Web Design, Print Design, or Video Design; Website Development, Ecommerce Development, or Mobile App Development; Search Engine Optimization, Social Media Marketing, Pay Per Click Advertising, or eMail Marketing; you can trust MosaicVisual to provide sound strategy and efficient execution. Our success is 100% dependent on your success so you will find we are keenly interested in learning your business inside and out to better serve your needs. We will exceed your expectations.